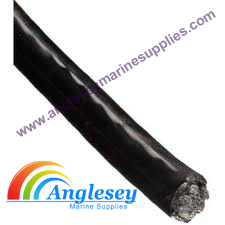 Anglesey Marine Supplies...We have recently updated our supply list to include a comprehensive range of marine and boat ropes lines and cables. We now supply yacht ropes in polypropylene braid and polyester braid, nylon shockcord in various thickness and associated shock cord hooks. Wire rope manufactured from stainless steel and also galvanized steel, cable crimping and swagging tools and also cable sleeves in copper and aluminium. Sail ties with plastic balls now also stocked. Pre stretched polyester rope now in stock. Polypropylene braided rope, a flexible rope with a strong centre core. 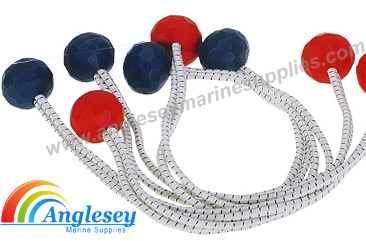 Ideal for boat anchoring and mooring lines, remains soft and easy to handle, can also be used for boat covers, sheets etc. Comes in various thicknesses, please use drop down bar for choice. Flexible braid on braid pre-stretched polyester rope for sheeting. Easily spliced, remains soft and easy to handle. Does not absorb water or rot.. Supplied in white with red tracer. 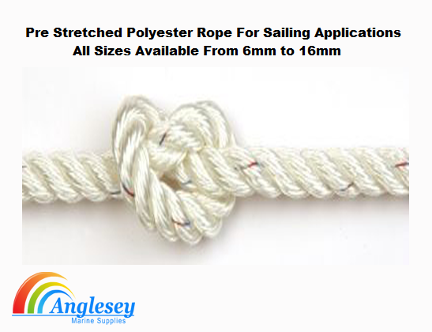 For the cruising yachtsman 3 Strand Pre Stretched Polyester rope has a multitude of uses. 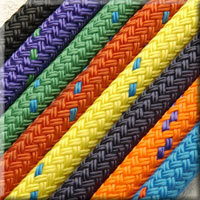 The pre stretched polyester rope is easy to handle when wet or dry and is highly resistant to UV light and weathering. The pre stretched polyester rope is available in white. All sizes of pre stretched polyester rope available. Toe-strap and general purpose 50mm. 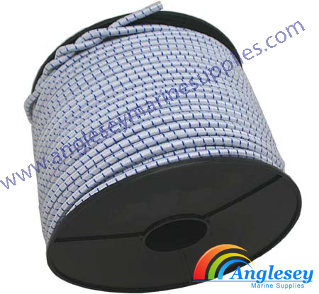 Polyester webbing strap. 2100kg. breaking strain. Ideal for boat trailer winches, ratchet straps, tie downs etc. Sold per metre, please enter meters required as quantity. Pistol grip thermal rope cutter, 220v. 30w for the cutting and sealing of marine, boating polyethylene and polypropylene rope and braid. New product recently introduced for the 2013 boating season. 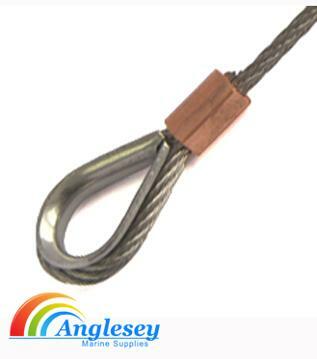 Stainless steel wire rope 7 x 19 construction cable, cut to required length and sold per metre. Available in sizes 2mm, 3mm and 5mm. Use drop bar for size choice and enter length in metres as quantity required. Galvanized steel wire rope, 2mm thickness, 7 x 7 construction. Cut to length and sold by the metre, Please enter metres required as quantity. PVC coated galvanized wire boat cable pulley steering cable. Available per metre, please enter meterage as quantity required. Marine, boating, yachting and sailing. 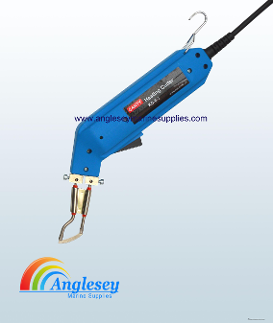 galvanized and stainless steel cable crimping tool to manufacture your own marine rigging cables. Copper and aluminium cable sleeves sold separately below. Will crimp cables up to 5mm in diameter. 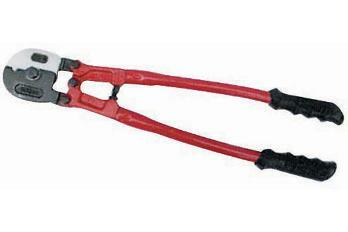 Marine Rigging wire cutters for cutting stainless and galvanized yacht and boating rigging and boat steering cable. Will cut cable and wire up to 6mm thickness. 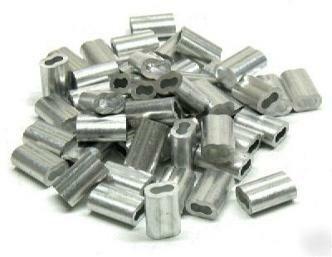 Aluminium cable crimping sleeves for the swagging, crimping of cables. Used for making your own rigging cables. Available in different sizes 2mm, 3mm and 5mm. Please use drop bar menu for size choice. 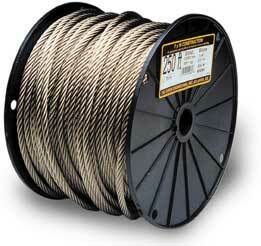 Marine grade nylon shockcord manufactured from premium grade rubber and nylon braided. Marked with a blue tracer thread. 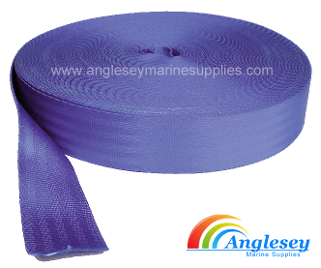 Ideal for manufacturing tie down for boat covers and tying up sails etc. 3 different thicknesses available 4mm , 6mm and 10mm. 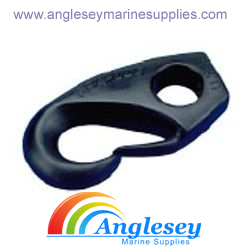 General purpose nylon shockcord hooks, ideal for the manufacture of tie down ropes for sails, boat trailer covers, boat cover tie down ropes etc. Sold in sizes 4mm, 6mm, 8mm and 10mm. 4mm elastic boat sail ties with double shock cord available in different lengths from 300mm to 600mm. 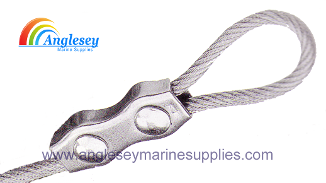 A4 316 Marine grade stainless steel wire rope grips, quality marine rigging from Anglesey Marine Supplies. Available in a range of sizes, please use drop menu for size choice. Bronze wire rope clamps. 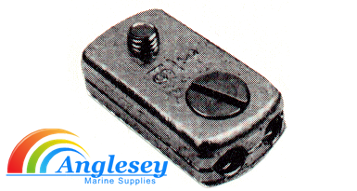 Marine rigging enclosed bronze clamp. 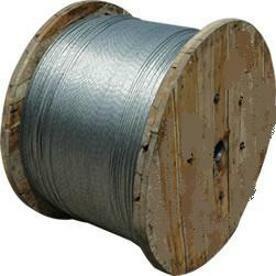 Used for stainless steel wire, galvanized steel wire and boat cable pulley steering cable. Evolution race 78 has a high performance Dyneema sk78 12 strand coated core that is high strength, low stretch and low creep. It also as a hard wearing ht braided polyester cover and is easy to splice. 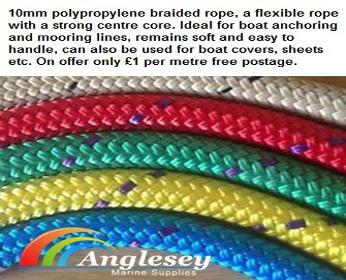 A quality Dyneema marine yacht rope, Available in colours red, blue, silver, gold, black and white. 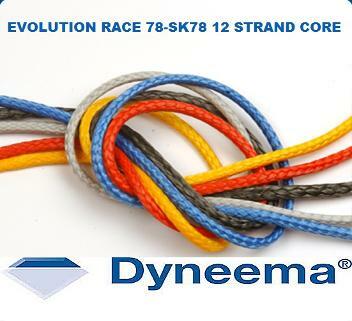 Dyneema evolution race 78 breaking strains as follows. 2mm-200kgs, 3mm-370kgs, 4mm-800kgs, 5mm-1020kgs, 6mm-1600kgs. Prices are per metre, please enter required metres as quantity required. Racing Dyneema® has a Dyneema® SK78 12 strand coated core and braided HT polyester cover. It is very strong, low stretch, lightweight and easy to splice and is ideal for halyards and sheets. 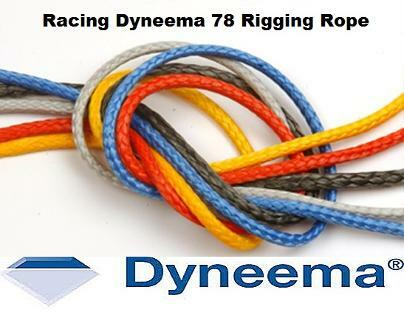 The Racing Dyneema 78 rigging rope is available in the following colours. Red, Blue, Silver, Black, Green, Gold, White, Classic, Melange Blue, Melange Black, Melange Silver, Melange Red. The Dyneema 78 rigging rope is of a very high breaking strain and tested to the following. 8mm-3500kg, 10mm-5250kg, 12mm-7050kg, 14mm-9300kg, 16mm-12200kg. Please enter metres required as quantity, please also add the colour required in the text box.